This ESA Contact Number is a call connection service which will connect you to the official helpline. Calls cost 7p per minute, plus your phone providers access charge. We are not affiliated with ESA. Update: You can now check whether you should be claiming ESA or Universal Credit by viewing this list of local Jobcentres. Contact the ESA customer service team for general information and advice on Employment and Support allowance. This number will connect you to the Jobcentre Plus who can also help you with your existing claims for ESA. The local rate phone number is 0345 608 8545, more information can be found on the Gov.UK website. Lines are open Monday to Friday 08:00 – 20:00. The ESA benefit offers financial help to people unable to work due to illness or disability. It also offers a reduced amount of support to enable you to return to work. You may have recently been switched to ESA if you had previously received Income Support or Incapacity Benefit, as these benefits have changed. The Gov UK Benefits website provides a reliable phone number to reach the Jobcentre Plus for all ESA enquiries; this is also the contact number to call for ESA existing claims and appeals. This telephone number can also be dialled for help and support with any matters which you may be unable to find an answer to online. What are the ESA Rates? £57.90 per week if you’re under 25. £73.10 per week if you’re 25 or over. £102.15 per week if you’re attending a work related activity group. £109.30 per week if you’re attending a support group. Depending on the outcome of the assessment carried out during the first 13 weeks, you will receive different types of Employment and Support Allowance either contribution-based or income-related ESA. You may be eligible for income-related ESA if you don’t have enough money coming in and you need extra support. The amount you will receive depends on certain criteria, whether you live alone or with a partner, how much you earn and if you have any savings. 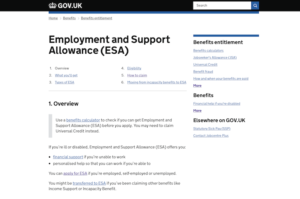 You may be entitled to income-related Employment and Support Allowance on top of contribution-based ESA depending on your circumstances and the work related assessment. Those receiving income-related ESA and attending a support group will receive an additional premium of £15.75 per week, or £61.85 per week if they qualify for the severe disability premium. You may be entitled to contribution-based ESA if you have paid enough National Insurance contributions over the last few years. You will be paid a basic rate of ESA for 13 weeks while your work capabilities are assessed, after this period you will be placed in either the work related activity group or ESA support group where you will receive either £102.15 per week or £109.30. Your allowance will be calculated based on your circumstances, which will be assessed during regular meetings with an adviser. If your assessment takes longer than 13 weeks then your payment will be backdated to the 14th week, to make sure you don’t miss out on the support payments you’re eligible for. Providing you meet the criteria, you can call the ESA claims number to start your application today. The quickest way to apply is to call our ESA Claims Telephone Number on 0843 515 8676. When making a new claim, make sure you have your personal details to hand. Your National Insurance number and postcode are often all that’s required to positively identify you, but more information may be needed depending on the circumstances. You may be asked to undertake a work capability assessment, this could involve filling in a questionnaire about your medical history or attending a physical medical assessment which is carried out by a doctor. This benefit is known to be much harder to claim than the incapacity benefit it has replaced. If you are successful with your application you will be placed into one of two groups, the ESA Support Group or Work-Related Activity Group. The fastest and easiest way to make an application is to contact the DWP by phone on 0843 515 8676. You can also complete an interactive ESA1 form online and print and sign, you can download the form here. Once you have completed the form you will need to call the Job Centre on 0800 055 6688 to find out where to send your application to, you will more than likely be asked to take it into your local Job Centre. Find your nearest Job Centre here. The 2016 benefit cap may affect you if you receive Employment and Support Allowance. This won’t affect your claim if you receive the ‘support’ element, but if you’re unsure then you should check with an representative. The amount you receive in total may reduce if you currently receive more than the cap amount, which can be calculated by visiting this link. You can also get in touch by telephone if you have any questions in relation to the cap. How do I ask for a Hardship Payment? Hardship Payments are available to those who’ve had a sanction to their ESA. If you have received a Sanction letter for not attending your interview but feel you have a good reason for doing so, the ESA contact number is available so you can speak with an advisor. You will be able to request a Hardship Payment (similar to a Crisis Loan), or explain why you missed your interview in order to have your benefits reinstated. If you’ve been told you’re no longer eligible or had a sanction imposed, you can follow the appeals process. You should initially ask for a mandatory reconsideration within a month of the decision by calling the Employment and Support Allowance number, so that all the facts surrounding your circumstances can be reviewed. After this, the appeals process is overseen by the Social Security and Child Support tribunal. Citizen’s advice may be able to assist you with the relevant forms or in finding representation for the hearing. The phone numbers on the Gov UK Benefits site have been published to make life easier for you, should you need to claim or find out more about the support available. Contact numbers for all of the benefits on this website can also be found within the public domain. Should you be looking for a low cost number to call then you can rest assured that we only list numbers costing 7p / minute plus your operator’s access charge. Call the ESA Contact Number today on 0843 515 8650. What Information Do I need to Claim ESA? How long can I claim ESA for? The amount of time that you can claim ESA for depends if you are placed in the work-related activity group or support group. Once you have reached the end of the 13 week assessment period and if you are placed in the work-related activity group you can claim contribution-based ESA for upto 365 days or until you are deemed fit for work again. If you are placed in the support group there is no time limit on how long you can claim ESA for. ESA can be quite difficult to claim for and you may need to undergo continuous interviews and working capability assessments throughout the period of time you are receiving the benefit. What is involved in the ESA Working Capability Assessment? When you make a claim for Employment and Support Allowance you may be asked to undertake a working capability assessment. This may involved a questionnaire or may require for you to undergo a medical assessment. Your medical assessment will be carried out by the Health Assessment Advisory Service and will be done by a medical professional. Once your application has been processed you will receive a call to arrange an appointment. If you prefer to call them yourself you can get in touch on 0800 288 8777 or email [email protected]. You can also claim travel expenses back for attending the interview so keep any public transport receipts or note car mileage as you are able to claim 25p per mile. How Old do I have to be to claim ESA? You can claim ESA from the age of 16 onwards. The amount you are eligible for in the initial 13 week assessment period does depend on age and you will receive slightly higher payments if you are over the age of 25. What can I Claim after ESA Stops? If your ESA payments stop for any reason or you are seen fit for work you may be eligible to claim for Universal Credit. Universal Credit is a new benefit that became available in 2013, it aims to support those looking for work or those on a low income. You can call the Job Centre on 0345 608 8545 to see if you are eligible. Is ESA a Taxable Benefit? Thankfully ESA isn’t considered a taxable benefit so you won’t be expected to make tax contributions whilst claiming. The Employment and Support Allowance benefit is paid every two weeks into your bank account, building society or credit union. If your payment is due on a weekend or bank holiday you will be paid the last working day before the holiday. What do I do if my ESA has been stopped? If you are in the work-related activity group and don’t attend an interview, assessment or training day your benefit maybe stopped and you will receive a sanction letter. If you had a good reason for not doing one of the above for example had to go to a medical appointment or your health prevented you from attending you can appeal the decision however you will need proof. The sanction will last until you next go to the interview or activity that you missed, your payments may not automatically start again once you attend. You will need to contact the DWP to discuss the next steps. If you believe your ESA payments have stopped for any other reason you can call 0843 515 8650 to speak to an adviser or visit the Citizen Advice website for further advice. Is there a Freephone ESA Number I can Call? Yes you can call 0800 055 6688, Monday to Friday 8am – 8pm. Unfortunately lines are closed weekends and bank holidays. Calls to 0800 numbers are free from landlines and mobiles however check with your phone provider before calling from a mobile. If you are unhappy with the ESA application process and need to make a complaint the quickest way is to call the Employment and Support Agency phone number on 0843 515 8650. Is there an email address for ESA? There is an email address for Department for Work & Pensions which ESA falls under – [email protected] however please be aware response times for a reply on this email address can be over 7 working days. The fastest and easiest way to speak to someone regarding a new or existing ESA application is to call 0843 515 8650. As an existing claimant, you will need to inform the Jobcentre Plus of any change in your personal information or circumstances. This can include a change of address, change of name, contact details or a change in your employment situation. You can get in touch using the support number listed here, which will work from your mobile or landline. In order to have your call directed, press 1 for new claims and 2 for all other enquiries.